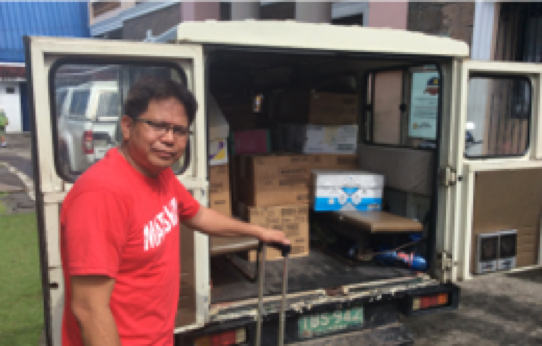 Dominic Bangal, IHHELPP representative in the Philippines supervised distribution in Pagbiao and Camiling. IHHELPP sent boxes of goods to the Philippines, among which were books and school supplies donated by Rock Canyon Elementary School in Provo, Utah. Julie Austin and her custodial crew diligently packed the books that eventually made their way to the Pahilippines via CharityVision, another non-profit foundation that has been working tirelessly in the Philippines and other counter countries. Included in this humanitarian shipment were books, clothing, school supplies and other items donated by Doreen Shields family, the Launfall Foundation thru Sis. Pam Cox, cloth dolls made by the youth in Sis. MarjAnn Ober's Salem neighborhood, and other sources. ​IHHELPP distributed the items to Pagbilao, Quezon and Camiling, Tarlac and to other LDS members and non-members. Rock Canyon school also donated small chairs that were donated to the families with small children.